The Medizinische Flüchtlingshilfe Bochum (Medical Care Service for Refugees Bochum) is a socio-medical human rights organization that campaigns for the rights of refugees and fights against conditions forcing people to take refuge. Besides the direct treatment of refugees, the work of the organization also focuses on the complex of causes of disease imposed by the reasons and the course of the refuge. The human rights situation in the countries of origin and the worldwide impunity of severe human rights violation represent decisive factors. With its campaign “Justice heals”, the Medizinische Flüchtlingshilfe Bochum is part of the international fight against impunity of crimes against humanity since 2001 and promotes the prosecution of perpetrators. From 2004 to 2006 the campaign realized a research-project, financed by the NRW Foundation for Environment and Development. The aim of this project was to develop a study about the conflicts and methods in dealing with past crimes in the following countries: Argentina, Chile, Guatemala, Paraguay, Uruguay, Peru, El Salvador, Rwanda, South Africa, Sierra Leone, Cambodia, Timor Leste and former Yugoslavia. The study will be published in German language, presumably in spring 2008. Translations into English, French and Spanish will follow. 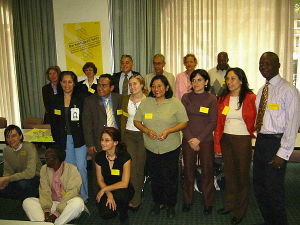 elaborated during the congress "Justice heals - The international fight against impunity" in 2005. Furthermore, from October 14th to October 16th 2005, the campaign organized an international congress in Bochum. Speakers of human rights organizations from 17 countries exchanged their experiences and strategies in the fight against impunity. At the end of the congress all participants adopted a resolution adressing the German government, the governments of all countries and the international community. As a result of the congress as well as several delegational visits, the campaign “Justice heals” established contacts with about 60 organizations and individuals willing to support a worldwide network in the fight against impunity. As of March 2007, the Medizinische Flüchtlingshilfe Bochum provides a coordination office for a worldwide network in the fight against impunity. This project is financed by Misereor: Thank you very much! The network is used to gain regular and up-to-date local information and in return make it available to all partners in the network. In the framework of international campaigns, the network will be capable to react rapidly to current developments in the fight against impunity on the international level. Bianca Schmolze Bianca Schmolze has a Master of Business Administration and works for the Medical Care Service for Refugees since 2002. After serving as a fundraiser, she became responsible coordinator of the "Justice heals" campaign in 2004. Furthermore, she has a mandate in the city council of Bochum.